Tom Heaton, Burnley’s 30 year old goalkeeper, is currently one of the best performing ‘keepers in the Premier League. Heaton, who joined Burnley in May 2013 from Bristol City, started his career at Manchester United but failed to make a senior appearance, instead being sent out on various loan spells before joining Cardiff City permanently in 2010. He made 29 appearances for Cardiff, before playing 43 games for City. Heaton has made 25 appearances for Burnley this season, making a league high 105 saves. He is also third in the list of saves per game in the Premier League. But Burnley are in 12th place in the league after 28 games, having conceded only 42 goals, fewer than every other side from 11th place West Ham down, with the exception of Middlesbrough (who have conceded only 30, but scored a paltry 19, giving a goal difference of 11, the same as Burnley’s). The numbers certainly suggest that Burnley are good at blocks, and their central defenders especially so. Burnley are top of the table for blocks. Michael Keane and Ben Mee are especially prolific. Keane has made 35 blocks, also a league high. Ben Mee has made 34 blocks, in joint second for the league with Hull’s Curtis Davies. Keane (1.25 blocks per game) and Mee (1.21 blocks per game) are also 5th and 6th for blocks per game in the league. These data, allied to Thompson’s excellent article, certainly suggest that Heaton is getting a lot of help from his defenders’ positioning and Thompson is persuasive when he suggests this is a deliberate, coached defensive ploy. I looked at all 105 of Heaton’s saves, and the 35 goals he has conceded, and assessed firstly whether there were blockers for his saves and secondly, whether he had to dive to make the save. Obviously, this is slightly subjective: for example, I counted contested headers as having ‘blockers’ in place, and did not count as a dive when Heaton scooped the ball while falling forwards as his positioning did not require a step and sideways dive; similalrly, saves hit at him that required a jump but no sideways movement are not recorded as dives. In short, I sought to look at when Heaton’s positioning, taking Burnley’s blocking into account, meant he did not have to move more than one step left or right to make the save. Firstly, in 80% of Heaton’s saves, at least one blocker was present between him and the player taking the shot. In some instances, these were players contesting a headed effort, or the wall in a free-kick, but fully 84 of Heaton’s 105 saves had at least one player either covering part of the goal angle or actively closing the shot. Further to this, in only 47 of Heaton’s 105 saves did he have to dive to make that save. This suggests that his positioning is excellent. Positioning is both absolute and relative: Heaton rarely strays more than a metre or so from his line and moves rapidly from side to side, so his absolute positioning is good, but he also aligns himself well with his defenders, or they align themselves well with him and the goal, so it works relatively too. Heaton has made 24 catching saves, twice as many as the next ‘keeper in the league, which again shows that he positions himself well to make saves that he can hold directly rather than tipping or palming away; this again reduces the secondary danger that can arise from saves. Take this save against Liverpool from game week 28. The attack looks threatening for Burnley initially with Sadio Mane in space as the Reds break with pace. 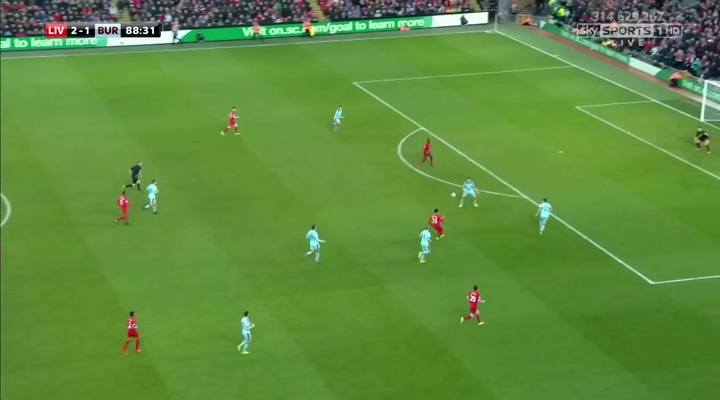 As Mane receives the ball, two defenders converge quickly on him and Heaton starts to move forwards to narrow the angle. Mane’s touch isn’t too bad, but already Burnley’s defenders have closed the angle to such an extent that very little of the goal is visible. Heaton is almost on the edge of the six yard box, covering the goal. 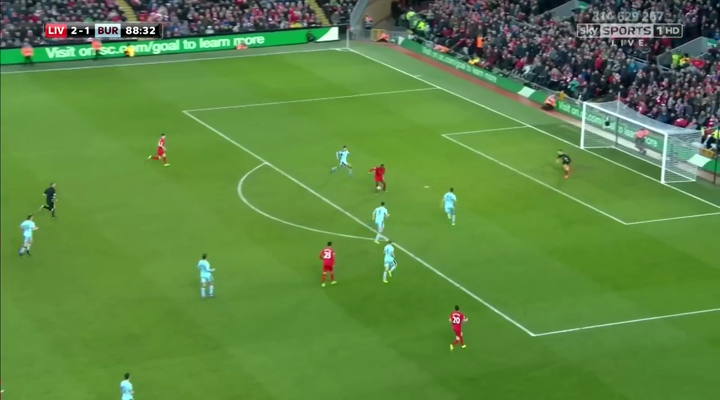 Mane manages to get a fierce, rising shot away anyway and credit to him, but it can only go between the two Burnley defenders and Heaton tips it over without needing to move laterally. Note also how two other Burnley defenders are still running towards the ball; this is a side who defend with real commitment. Again, here are two examples from Burnley’s away game at Manchester United. Note how with Juan Mata’s shot, Burnley defenders are standing almost in line with the posts but close to the shot taker, forcing a shooting corridor, in the middle of which Heaton stands ready to make the save. And in this shot, there are three Burnley defenders between the shooter and the goal. While the furthest back, Mee, might be considered to be blocking Heaton’s view somewhat, again the shot is channelled to the ‘keeper at the near post, and he makes a comfortable save. The examples are numerous. Here are two from the Watford away game. Note in the first how it’s actually Burnley midfielders who are blocking, with the back four narrow, aligned, and very deep. Heaton catches the ball centrally, without having to move. Even when Heaton is caught without blockers in front of him, as in this example against Crystal Palace, it’s worth noting how a centre-back is haring back to cover the far post. Heaton saves low with his leg to the left, but even if he had not, it’s likely that the defender on the line would have covered the shot. Asides from the shooter and the Palace player on the ground (who knows he how he got there), the five nearest players to the goal, including Heaton, are all Burnley players: it’s no surprise that Burnley are able to win back possession and clear. Even when Heaton concedes, as with this goal at home to Bournemouth, the blockers are in place and the goal angle for Charlie Daniels is narrow. It’s only because Daniels is able to generate whip away from Heaton, across his body, that his superb shot beats the ‘keeper. The visual evidence clearly supports Thompson’s inference from the data, that Burnley make a concerted effort to narrow shot angles, and that this means that Heaton, whose positioning is naturally good anyway, frequently makes saves without diving because shots are channelled at him. Even when there are no blockers (21 instances), Heaton makes a save without diving 12 times, or 57%, which further shows his own positioning is strong and he is quick to close the angle of shooting. He is also capable of spreading himself at players’ feet to smoother shots. The away game at Leicester is instructive: most of Heaton’s saves are classic Burnley, shots channelled at Heaton who saves from distance without diving, but when Heaton can only parry one, he makes a smart diving stop at Jamie Vardy’s feet to deny him. He did the same against Manchester United, rushing out to block a Zlatan Ibrahimovic shot. What about the goals Heaton has conceded? Do they show any weaknesses? Discounting the five penalties he conceded, and the Mark Noble rebound effort after Heaton had saved his initial penalty, Heaton’s conceded goals show few weaknesses. The only clear error I can see that he made was palming a Swansea header into the path of an oncoming striker in the first game of the season; even that is perhaps harsh on Heaton. Four goals resulted from errors from defenders, or deflections from the blocking defender, one was a Mee own goal, and one, a curling direct free-kick by Robert Snodgrass while he was Hull, could be blamed on a gap in the defensive wall. Three goals came from corners, one a superb headed goal, one bundled in on the line, and one that was smashed by Nathan Redmond through several defenders attempting the block with Heaton totally unsighted. The greatest proportion, 14 goals, come directly from crosses, some whipped at pace low across the box, and often because the header or finish were of high quality. Heaton managed to get a touch on seven of the 35 goals, including one of the penalties, but that means that for 80% of the goals conceded, Heaton didn’t touch the ball. Much of that is to do with the quality of finishing. Heaton does concede low to his left and if the ball is hit hard and close to his right hand side, but these are not consistent weaknesses, just examples where more than one goal has come from a certain type of shot. It’s noticeable, though, just how many of the goals scored against Tom Heaton are simply very good goals. Heaton is a quality ‘keeper. There’s a line from Justin Bryant’s goalkeeping autobiography, Small Time, where he quotes American professional ‘keeper Winston DuBose: “Real goalkeeping, serious goalkeeping, is not about spectacular saves. It’s about positioning, footwork, communication, and distribution.” In this regard, Tom Heaton is a real goalkeeper. His defensive organisation, positioning both in terms of absolutely and relative to his defence, who he organises brilliantly, and his leadership and communication are outstanding. He is the best current English goalkeeper and he’s one of the finest in the league. He is flourishing at Burnley under Sean Dyche, a coach who clearly understands defensive systems, but at 30 years old, this summer may see him enjoy one last major move. He would be an asset to any side.